Jamie is unable to do his preview today but I have done one myself please See Jamie Lindsay preview page. Joseph buys lot 32 Colt Dutch Art (GB) x Euroceleb (IRE) for €90,000 and lot 235 Lot 235 Colt Lope de Vega (IRE) x Rich Gift (GB) for €340,000 day 1 Goffs Ireland see Sales Page. Jamie Previews today's runners in the Jamie Lyndsay previews page. Breeders' Cup next for Intricately? Intricately looks set to be prepared for a trip to the Breeders' Cup following her victory in the Group 1 Moyglare Stud Stakes at the Curragh earlier this month. 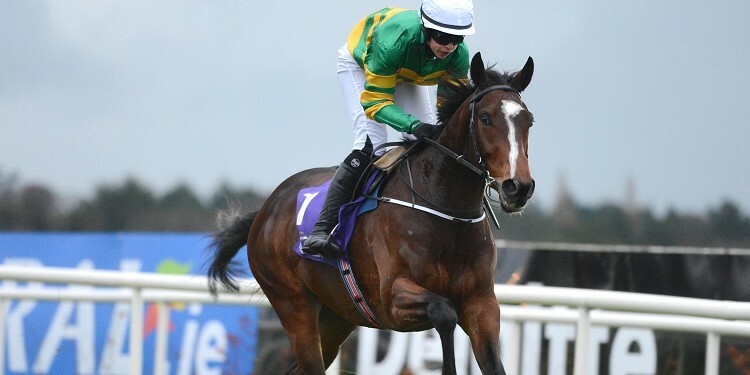 The daughter of Fastnet Rock a winner on her racecourse debut at Gowran Park in June and while she ran creditably in defeat in both the Group 3 Silver Flash Stakes at Leopardstown and the Group 2 Debutante Stakes at the Curragh, she was a 25-1 shot for her Group One debut. Joseph's juvenile belied those odds to provide the fledgling trainer with his first top-level success since his riding days, while it was also a first Group One triumph for his brother, Donnacha, beating Aidan's Hydrangea into second. Joseph is not ruling out a tilt at the Group 1 Fillies' Mile at Newmarket on October 7, but is leaning towards an appearance at Santa Anita. Joseph said: "Intricately has come out of her last race well. She's still in the Fillies' Mile, but it might come a little bit soon for her. She is more likely to go for the Breeders' Cup. I think faster ground will suit her and the step up to a mile. She has plenty of tactical speed and the race could be run to suit her." 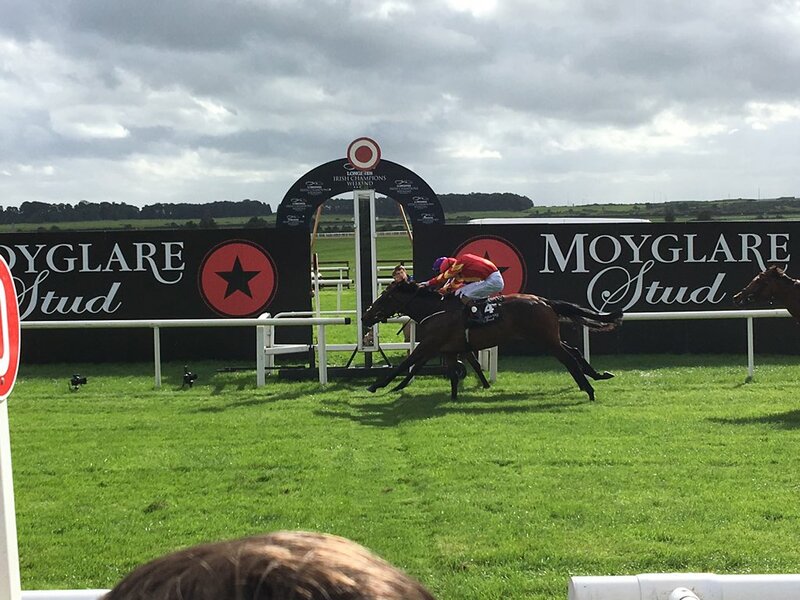 The Joseph O’Brien trained Art Nouvelle scored at the second attempt at the Curragh today, winning the Irish Stallion Farms EBF (Fillies) Maiden under the trainer’s brother Donnacha O’Brien. The O’Brien brothers were famously on the mark in the Group 1 Moyglare Stakes at the venue on September 11 with Intricately and today Art Nouvelle, a daughter of Art Connoisseur showed the benefit of a promising debut run at Naas, when beating Stormy Belle by a length and a half. Following the race, trainer O’Brien stated “she ran well in Navan where she got a bit tired and she has stepped up well today. She seems to handle the ground okay and has plenty of pace and finished off the race well. Joseph purchases two lots day one September Yearling Sales Tattersalls Ireland details can be found in the Sales page. 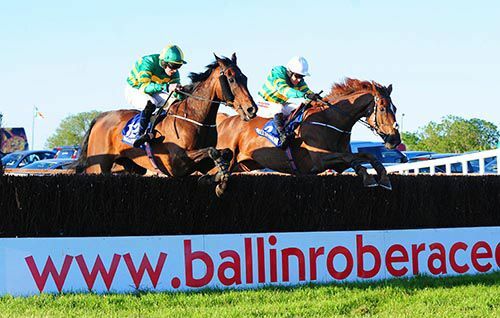 The Sponsors Day At Ballinrobe 3-y-o Maiden Hurdle saw trainer Joseph and owners the Annus Mirabilis Syndicate responsible for the first two home in the 2.15 race,as the well supported 6/4 favourite Lord Justice beat Zig Zag by a short head,with Champange Pat back in third. Lord Justice was held up in mid-division,was 9th at halfway,he made headway 3 out to chase the leaders after the next where he was pushed along on the outer, he improved to dispute before the last where he led,he was strongly pressed under pressure and was all out in the closing stages,he just held on. Joseph's cousin J J Slevin was aboard Lord Justice, whilst Jody McGarvey was on 5/1 chance Zig Zag. JJ Said "I thought I was beat. I looked at the replay coming in and thought I was done on the line, He's a grand horse and improved from the last day. The ground is probably as soft as he wants it. He will be a nice horse going forward. I'm happy I turned professional at the minute anyway. Joseph is looking after me,and with a bit of luck hopefully I can kick on. " We are delighted to announce the relaunch of JOBFS with new pages & content and a new Management team. We would like to welcome Jamie Lindsay to the team who will be our race previewer you can now view the new pages that have been added into the navagation menu please feel free to take a look around. Walk the Line a Non Runner, Ligeti, Druids Cross and Inescapable all unplaced on their debuts at Gowran. The Group 1 Fillies' Mile and a trip to the Breeders' Cup are the options under consideration for Intricately following last weekend's victory in the Group 1 Moyglare Stud Stakes. 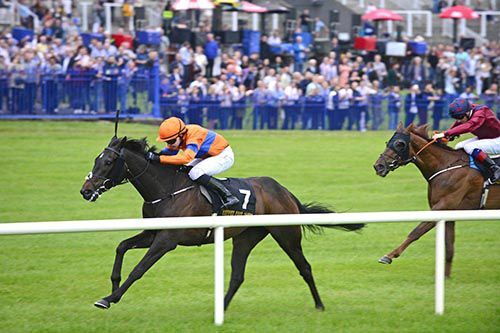 The daughter of Fastnet Rock was a surprise winner on her racecourse debut at Gowran Park in June and ran creditably in defeat in both the Silver Flash Stakes at Leopardstown and the Debutante Stakes at the Curragh, she was a 25-1 shot for her Group One debut. Joseph O'Brien's juvenile belied those starting odds to provide the fledgling trainer with his first top-level success since his riding days, it was also a first Group One triumph for his brother, Donnacha, beating their father Aidan's Hydrangea into second. Joseph said " We were fairly confident. You couldn't say she was going to win, of course, but she was definitely going to give you a good run for your money, Both mentally and physically she has been improving all summer and she's bred to improve with time and racing. I'd imagine she will have just the one more run this year. She's in the Fillies' Mile at Newmarket and more than likely that's where she'll go - though the Moyglare is a 'Win-and-You're-In' for the Breeders' Cup, so that might be the other option. With that pedigree, you'd hope she would make a three-year-old." 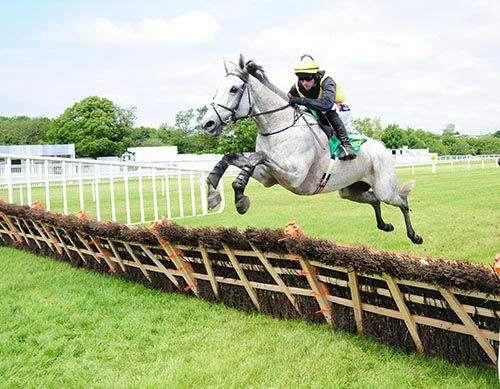 Aspen Colorado got off the mark over jumps when keeping on well in the two mile maiden hurdle at Listowel. The four-year-old son of Galileo had won two bumpers for Aidan O'Brien before running ninth in the Grade One Champion Bumper at Punchestown in April, today was his first start for Joseph. Aspen Colorado raced in seventh before improving to 5th at the halfway stage. He made good headway to be almost on terms four out and led narrowly at the third last. On the run to the penultimate flight, Sanibel Island loomed large on his outer. The leader was far from fluent there but Golden Poet, in third, made a bad blunder which cooked his chance. Once Aspen Colorado negotiated the last, he picked up well to see off Sanibel Island who was unable to reel him in and went down by three parts of a length, Golden Poet kept on for third, a further seven lengths away. Mark Walsh his Jockey said: "He jumped well on the whole. He missed the second last and Jack on Sanibel Island was coming to me and in fairness he stuck his head down and battled well on ground that was very tacky. It's not his ground and I didn't really travel the whole way - his class got him through. He'll improve a lot for today. Hopefully he can go into his novice hurdle now and keep stepping up." Horses in training page updated > http://josephobrienfansite.com/horses-in-training.php . 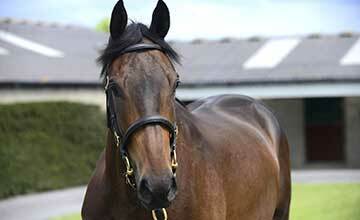 Aspen Colorado entered in the John Lynch Memorial M'dn Hurdle of €13,000.00 4-y-o 2m. Saturday 17th September. It was very much a family affair with his father, Aidan, saddling four of the other six runners in the seven-furlong contest and it was O'Brien senior's Hydrangea that attempted to make all under Padraig Beggy. The pacesetter stuck to her guns when Donnacha O'Brien's mount laid down her challenge and with nothing between the pair as they did battle in the final furlong, Intricately got the nod by a short head for a 25-1 shock. The winning trainer said: "It's unbelievable. She's very tough. 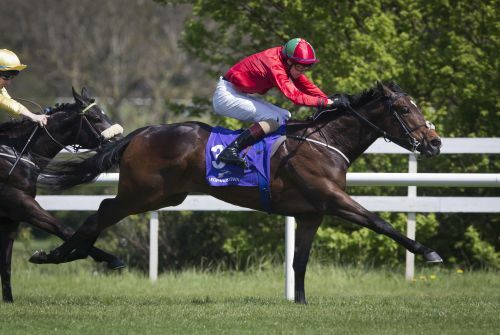 She's been running well all year and Donnacha (brother) gave her an unbelievable ride today." He went on: "This means the world to me. It's Donnacha's first Group One and my mum bred her. She's very tough and Donnacha was very strong on her. "She's in the Fillies' Mile at Newmarket, and we'll see how she comes out of this. She doesn't have to run again this season. "I can't believe she was 25-1 as she was only a length behind the second-favourite (Rhododendron) the last day. "You probably get a bigger kick out of training winners than riding them, as a lot more work goes into it." Owners Qatar Racing Limited have renamed the Requinto 2yr from New World Order to Duplication thanks to Jim Reilly. 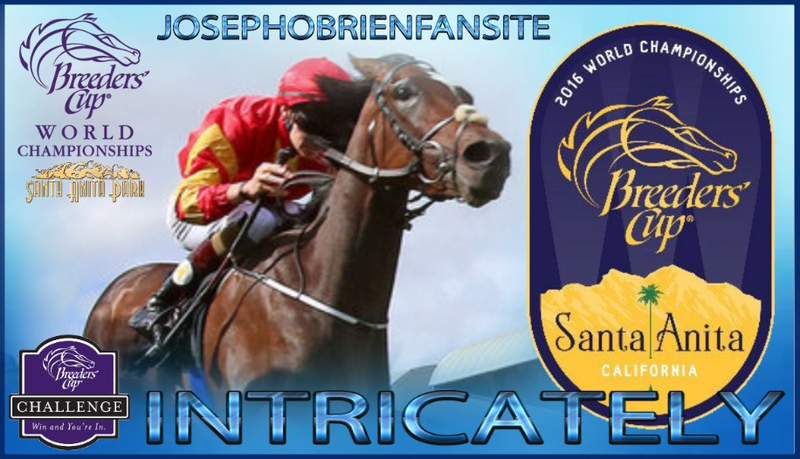 Joseph O'Brien 2YO Page Updated > http://josephobrienfansite.com/Joseph-O'Brien-2-Year-Olds.p… . 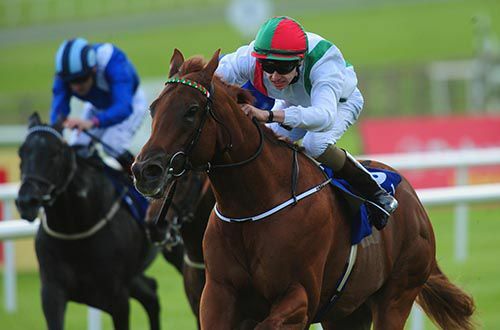 Joseph O'Brien Claims Clipper Logistics Leger Legends Stakes More pics at bottom of article. Joseph O'Brien came out of retirement in triumph with an enterprising ride on Phosphorescence to win the Clipper Logistics Leger Legends Classified Stakes at Doncaster. The two-time Irish champion only gave up riding earlier this year to concentrate on training, but showed he had lost none of his talent when making most on the George Scott-trained six-year-old. 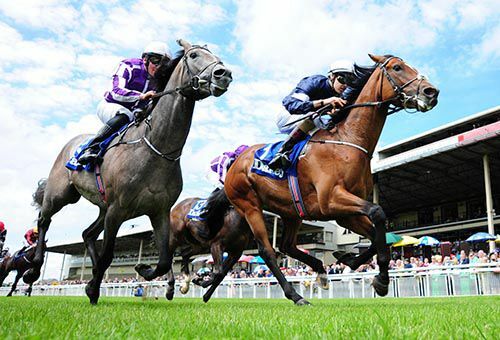 O'Brien won the 2013 St Leger on Leading Light for his father Aidan and the 23-year-old showed tremendous confidence as he steered Phosphorescence (7-1) home over the straight mile. Janaab (20-1), partnered by former jump jockey Peter Buchanan, was second with Red Charmer (20-1) third in the hands of 69-year-old George Duffield. 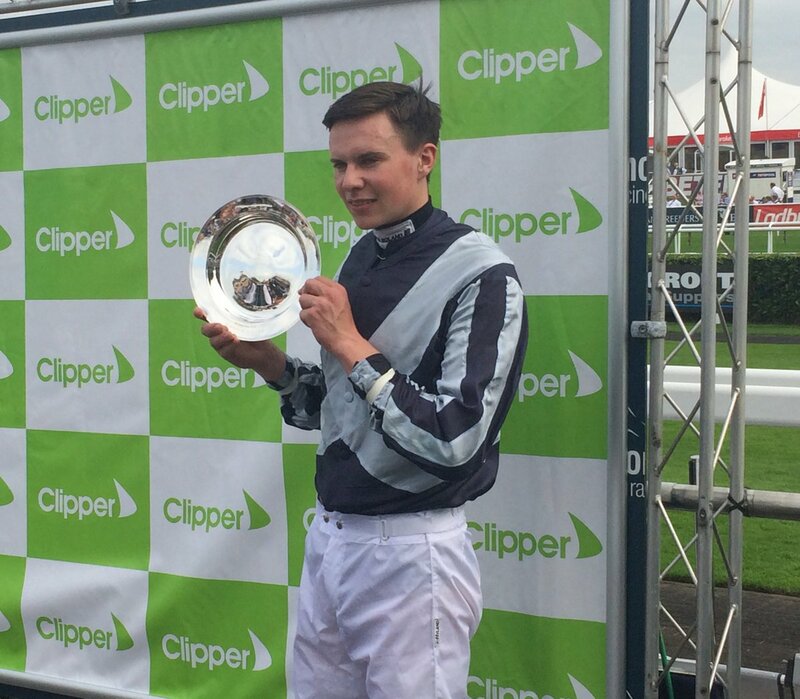 Joseph O'Brien is looking forward to returning to the saddle for a good cause in the Clipper Logistics Leger Legends Classified Stakes at Doncaster on Wednesday. O'Brien, 23, retired this year to concentrate on a training career after a long-running battle with his weight, but his riding career, though brief, was extremely successful. Twice champion jockey in Ireland, he won four British Classics, including Leading Light in the St Leger in 2013. He lines up on Town Moor aboard the George Scott-trained Phosphorescence for the special charity event in aid of Jack Berry House and the Northern Racing College. "I'm looking forward to it. There's been a bit of banter flying about, all in fun. It's all in a good cause," he said. "I haven't done anything out of the ordinary, I've been riding out a bit at home, so I shouldn't be too unfit, hopefully. "I don't know much about the horse I ride. I know he's been off the track for a while. He has some form in the past, so hopefully he can run a good race. "I love the training, it's keeping me busy." 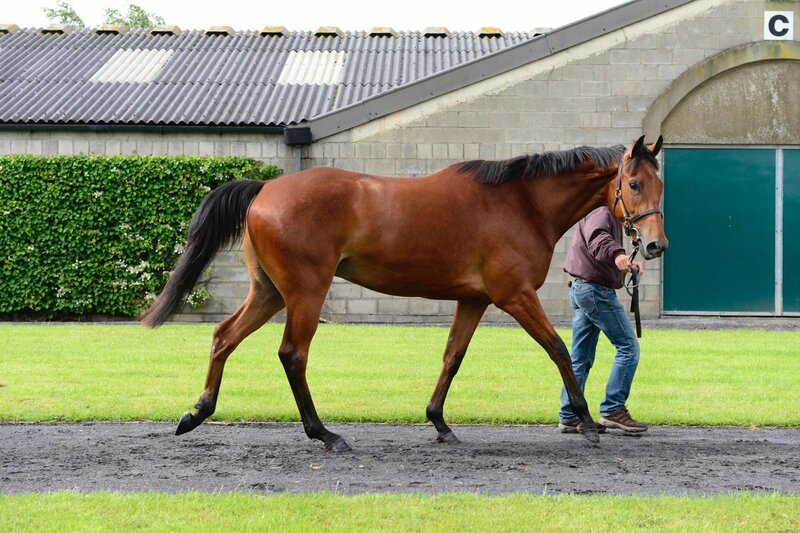 5 year old Gelding E13,500 buy, Half Brother to Lethimbelucky Mini Island & Merry Night. owned by Ann Marie O'Brien. Horse in Training page updated > http://josephobrienfansite.com/horses-in-training.php. 5YO Gelding Half Brother to Race winners Grecian Groom Pheidias Tannery General Brook Owned by Mrs D P Magnier. Joseph will bid to win his first group race next week at Doncaster and will be represented by Intricately in the Group 2 May Hill Stakes next Thursday. The Fastnet Rock Juvenile was a fine third to Rhododendron in the Debutante Stakes last time out. She has never been out of the top 3 in her 3 career starts and won her maiden at Gowran park smartly in June Beating Sir Edwin Landseer the duo pictured above. Should she win she will become Joseph's first ever Group race winner in either code. 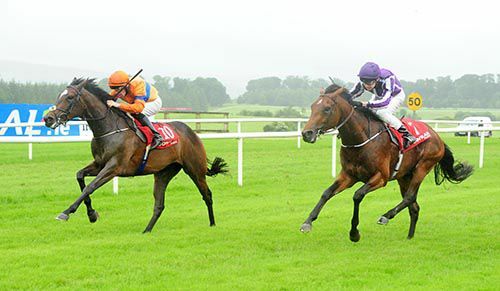 Jaqen H'ghar 4th, Dancing on Air unplaced, Sweetasever 6th and Richard Strauss 4th at Gowran Park 31st August. Delayed Eloquence 4th at Cork 28th August. 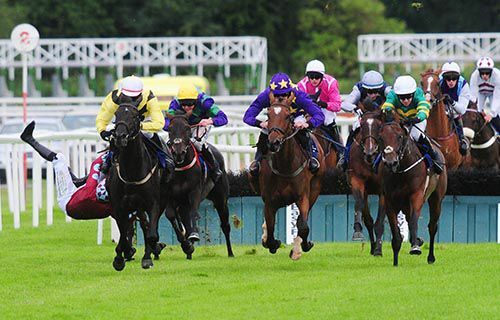 Ruby Gates 4th,Ineffable unplaced,and Art Nouvelle 4th at Navan 27th August. The Montjeu 4 year old out of Finsceal Beo was an unbeaten group 2 winning juvenile has now been transferred to Owning Hill to continue his flat career and has an entry in the Diamond Stakes (Group 3) at Dundalk on Friday 30th September. He will carry the legendary Australian owner LLoyd J Williams colours we are awaiting confirmation if Coolmore retain any share in him. Ol'Man River has been off the track for almost a year last seen at Longchamp in September 2015 in the Prix Niel where her finished 5th behind New Bay. He was scheduled to travel to Australia last October for the McKinnon Stakes but never made the trip. 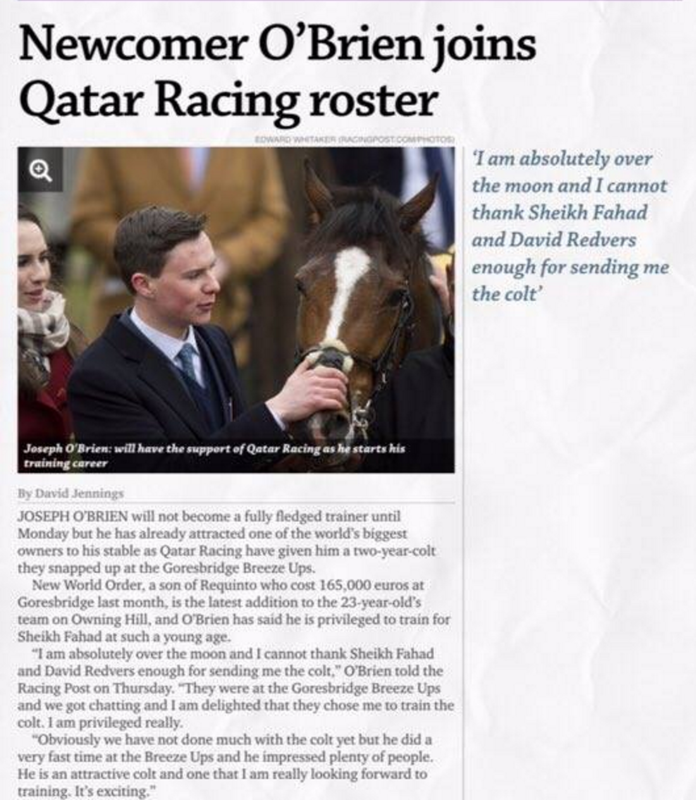 Jospeh O'Brien 2YO's Update > http://josephobrienfansite.com/Joseph-O'Brien-2-Year-Olds.p… . Joseph O'Brien dipped his toes into the sales pool at the the Goffs Yearling sale today. Joseph purchased Lot 32 a Bay Colt By Champion first season sire and leading European second season sire Zoffany out of Nashwan mare Ambrosine costing £39,000. Ambrosine raced 9 times and won 2 of those and also placed twice in her race career. This is her 7th Foal this Yearling is a Half brother to Race winner Cat Patrol & Race Placed Hang Fire. Joseph's Plinth won the Follow Kilbeggan On Twitter Hurdle at Kilbeggan on Friday, winning despite a final flight mistake, for Mark Walsh. The son of Montjeu was pressed by Killer Crow when making a mistake at the final flight but luckily for his fans, the eventual runner-up Killer Crow similarly made a mistake at the obstacle and in the end failed by just a head to reel Plinth back . from Windsor beach by ½ a length with Jaqen H’ghar his stable mate back in 3rd. He was given a positive ride here by Ana. He made virtually all the running ,disputed early and soon led, he went over 1 length clear at halfway, was ridden and pressed closely over 1f out, he was all out well inside the final furlong, held on well at the line. Jigsaw homed until recently at Owning Hill & trained by Joseph has now been sold by his mother Annmarie to Magnier Tabor & Smith and has been transferred to Ballydoyle were she will be trained by Joseph's father legendary Trainer Aidan. I Must admit I did think Ballydoyle were a little light on numbers and quality in the Juvenile fillies division and Cuff was a huge loss so if this filly is showing any kind of promise which obviously she is it makes sense to bolster the Ballydoyle numbers. Jigsaw is a 2yo filly by Galileo out of Encosta De Lago mare Empowering who was a 3 time winner with Aidan & Ran in the 2011 1000 guineas won by Blue Bunting. This is her first Foal. It would have to be seen as a blow to Joseph who no doubt will be well compensated for his loss with further support from team Coolmore now and in the future. 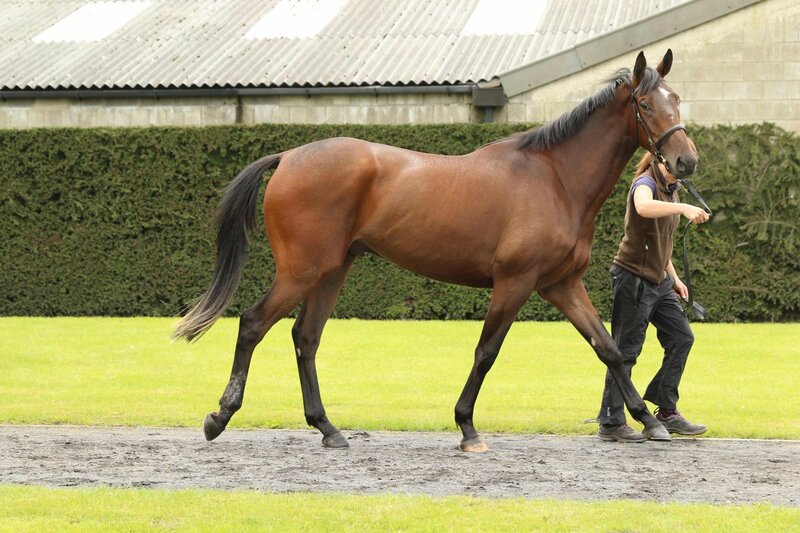 Join The Gowran Park Racing Club For 100 Nursery with Joseph’s other runner Pronounced finishing last of the 6 runners. went 3rd 1f out, she improved to lead narrowly inside final furlong, she stayed on well close home. Joseph said “I thought she would win a maiden earlier this year but took a few races to get hang of things”. Purchased at Goffs Doncaster HIT sale for £16,500. Half brother to race winner Snooze. Only one career win over fences which came at Fairyhouse in April in a novice chase. Owner is Joseph for now waiting for this to be confirmed. Thanks to Jim O'Reilly for the information. Joseph O'Brien's Hallmark put in a good jump at the last which was the key to his victory in the two mile maiden hurdle for four-year-olds in Roscommon. The 11/10 favourite looked to have a battle on his hands to overcome front-runningPateen but he got on terms at the final flight and landed in the lead full of running. He then strode away on the run-in to take the spoils by three and a quarter lengths.<Pateen (4/1) could give no more after the last but got a runner-up reward. He was a further three and a quarter lengths in front of Aretesone. He got the job done anyway,” Frank Berry, racing manager to owner JP McManus said. “He was running a nice race in Tipperary before he was brought down. He learned a bit from that experience and jumped away pretty well today. All the Answers was a well backed winner of the opening Tote Maiden Hurdle at Galway today, he over-turned the odds-on favourite Silver Concorde to win for trainer Joseph O’Brien and jockey Mark Walsh. he was going best before the last and ridden to lead on the run-in, He kept on well to assert his superiority in the closing stages winning by 2 ¾ lengths. Motherland proved popular with punters as he was sent off the 2/1 favourite from 7/2 in the morning and the money proved spot on in Ballybrit. 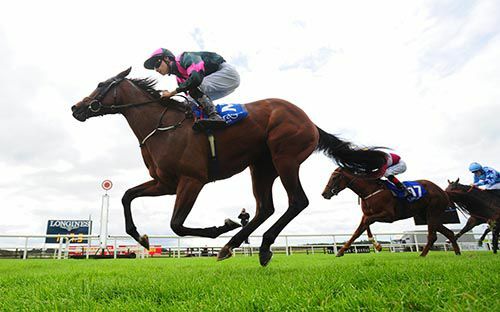 Last month's Ballinrobe winner had caught clear leader Restive with three furlongs left in this extended mile and four handicap.<Motherland and Donnacha O'Brien kicked on two and a half furlongs down and went further and further clear in the straight from Forceful, who tried in vain to hunt him down on the home bend. The winner put 17 lengths on Forceful (14/1) with Baliyka (3/1) a further three lengths back in third. On his first Galway Festival winner as a trainer, Joseph O'Brien said: "I suppose you get even more of a kick out of it if anything. He was working nicely and he has been improving with racing. I didn't expect him to win quite as well as he did. It was a funny kind of a race, the distances might have been exaggerated a bit but I think he's a nice horse. "He could be (a Stakes horse). Quite a well-bred horse. The rain probably helped him today and he stays very well. I thought he would go very close today and may be hard to beat but I didn't think he would win like that. "We'll see what the handicapper does but there is a 1m6f handicap at York on Ebor day for three-year-olds. He is good to jump but he might even be worth keeping to the flat." Aidan and Joseph O'Brien both field once-raced maiden winners in the Jockey Club Of Turkey Silver Flash Stakes at Leopardstown on Thursday. Aidan O'Brien has saddled a record eight previous winners of the Group Three contest and relies on Tipperary scorer Promise To Be True in this year's renewal. His son Joseph, who was aboard Maybe in 2011 and Wonderfully in 2013, runs Intricately, who made an impressive start to her career at Gowran Park and will be ridden by the fledgling trainer's brother Donnacha O'Brien. "That's been a long time coming. 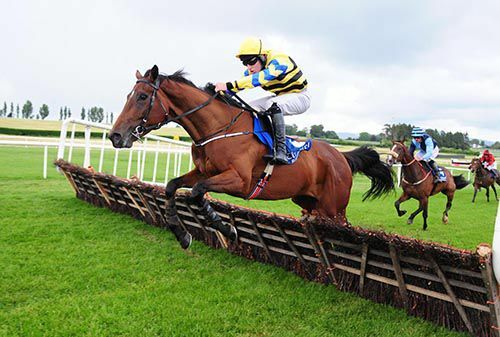 He didn't jump great," acknowledged Jody McGarveyafter winning the opening Paddy Smyth Memorial Maiden Hurdle at Ballinrobe on the J P McManus-owned and Joseph O'Brien-trained Cradle Mountain (11/4 joint favourite). A mistake at the last by Cradle Mountain, when in front, gave the pace-setting Echo Lady another chance. In fairness to the victor though, he toughed it out well on the run-in to land the spoils by half a length. "He's very highly rated on the Flat and would be entitled to beat them, but a lot of days he's been well fancied and didn't win so it's nice to get off the mark," added McGarvey. "He doesn't travel and doesn't jump so doesn't give you much of a feel." < Cradle Mountain was bred by the O'Brien family's Whisperview Trading Ltd, whilst the gambled-on Creative Talent finished fourth. Joseph O’Brien goes for his 9th National Hunt winner of the season And his 21st in total under both codes. 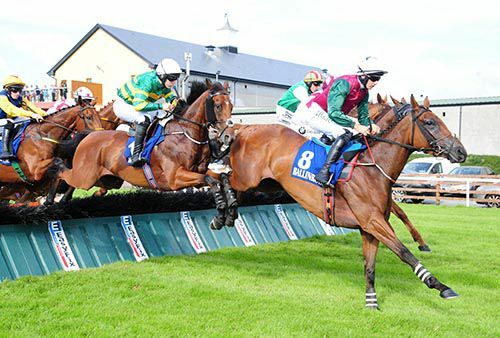 Cradle Mountain the 4 year old Mastercrafstman Gelding can be seen in the 6pm Paddy Smyth Maiden Hurdle at Ballinrobe tonight. 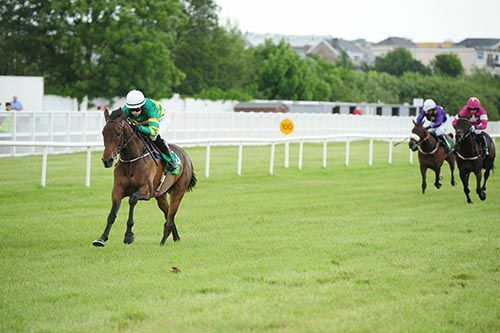 He was last seen out on the 10th of July at Sligo finishing ½ length second behind the shock 50/1 winner Sinndar Sandy in the Pet Stop Maiden Hurdle. Currently 13/8 with Paddy Power and 6/4 with Ladbrokes. King Leon recorded his second win of the season as he took the Tipperary Town Plaza Plate Handicap Chase. Successful in the Mayo National at Ballinrobe in May, the Joseph O'Brien trained seven-year-old since finished second to The King Of Brega at Limerick. Dropped in trip to two and a half miles today, he was sent off an 11/4 joint-favourite in the colours of owner JP McManus. The son of Mountain High came home with two and a quarter lengths to spare underMark Walsh (replacing the injured Barry Geraghty). Coldstonesober (6/1), who won this race twelve months ago, finished second underKevin Sexton for Jimmy Finn, while Finish In Style (11's to 9's) was a further half a length back in third under Niall Madden (replacing Mark Walsh) for Enda Bolger. Le Grand Chene was the other joint-favourite and he was a further length back in fourth under Jack Kennedy (replacing Bryan Cooper) for Gordon Elliott. Joseph O'Brien said afterwards: "He's a tough horse and probably wasn't as good a race as he ran in at Limerick the last day when he bumped into one. It's good to get him to win and it is a good pot to get. "He can make the odd mistake but is good usually and it was probably no harm he did make it (mistake six out) as he winged everything else after that. "The horses are running well and are healthy so long may that last - in time we'll have a nice team. "This fellow and Carriganog are in the (Galway) Plate and they'd be touch and go to get in but will run if they do. Tigris River might sneak into the hurdle and Plinth is in it too. "There is a chance a couple of them will get in - I don't think the entries are as big this year and if they get in, they'll run." The 2.55 Darley European Breeders Fund Maiden at the Curragh it looked a strong race on the book and was won in fine style by Arcada for Joseph O’Brien and ridden by Joseph’s brother Donnacha, The Rip Van Winkle colt was prominent throughout the race staying on to beat Capri in second with Taj Mahal back third it. 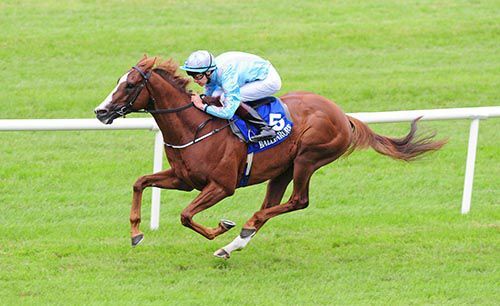 The race was touted as an introduction to Irish racing by Lightening Fast the first son of Frankel to race in Ireland but he was never a factor. Arcada was one of the most experienced in the field having had two previous runs. 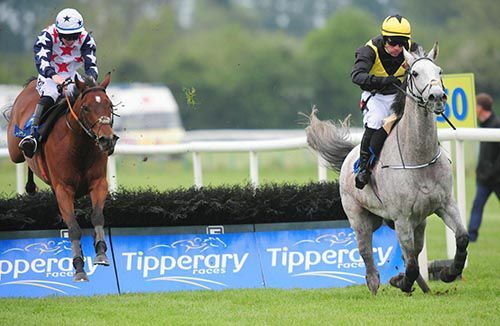 Capri trained by Joseph’s father Aidan ran an eye-catching race on his debut staying on well inside the final furlong but was always being held By Arcada. Joseph said “ he’s well entitled to take his chance in a group race now and should get a mile. 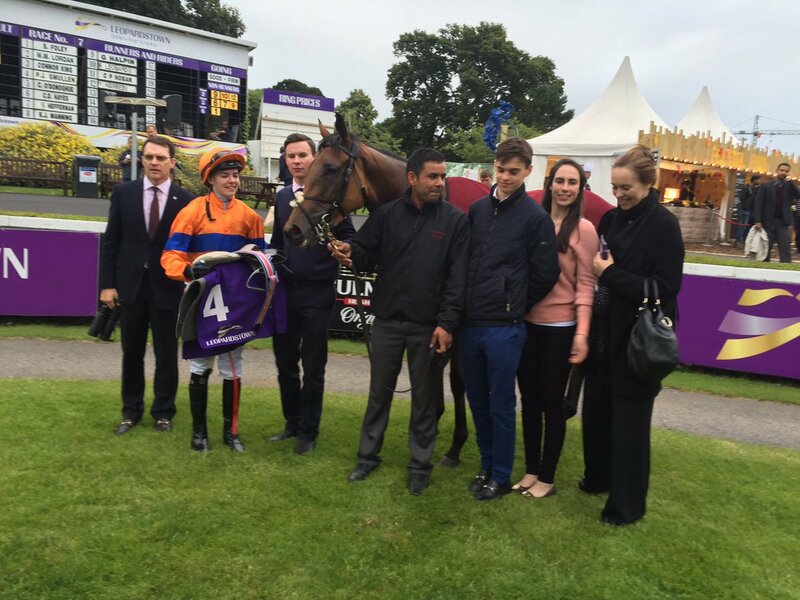 Arya Tara last night became Joseph’s first pattern winner when winning the Listed Stanerra stakes at Leopardstown. The rookie trainer who has only held his licence for just over a month has had a great start to his career. The Dylan Thomas filly was winning her fourth race in a row, she was stepped up in trip for this race to 1m 6f, she was always up with the pace lying in second for most of the race, she led going into the final furlong she stayed on well and was pushed out to win by a length from Avenante. Arya Tara provided Ana O’Brien with her biggest career win to date The filly also giving her a first ever double. A delighted Joseph said “ She is a well bred filly and has been progressing well, it’s great to get her to win a Listed race she stays very well. She gave me a first stakes winner and Anna as well so it’s a good evening. We will probably find a group race for her now, there’s a Group 3 Leger trial at the Curragh and all being well she might take her chance in that. The filly may give Oder of St George a race if they ever met in the Irish St. Leger. Fledgling trainer Joseph O’Brien saddles his first runner in a Classic since taking out his licence at the beginning of June with Way to My Heart in the Group 1 Darley Oaks at the Curragh on Saturday. The Galileo filly is still a maiden after seven previous starts, last seen out in June when she finished last of the seven runners in the Summer Ladies day Handicap at Navan over 1m 5f, 17 lengths behind the winner Ceol Na Nog. 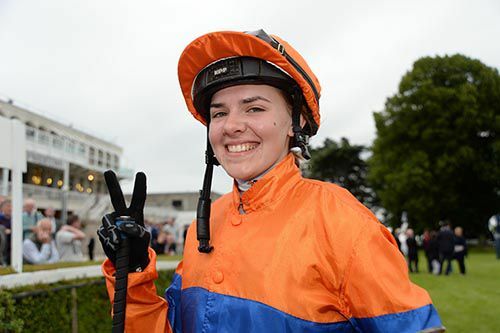 Ana O’Brien takes the ride on the filly hoping to give the brother and sister combination a fairy tail Classic success. Currently 100/1 with Paddy Power. Champion Owner J.P. McManus successfully combined with trainer Joseph O’Brien and jockey Barry Geraghty for a second Killarney win in two days when their Tesseract (5/2) landed the opening Larkins Pub & Restaurant Milltown Novice Hurdle at Killarney today. The trio were successful with long odds-on Oathkeeper at the venue yesterday and today scored with Tesseract, which held the late challenge of Hudson’s Bay by a neck. O’Brien wasn’t present and after the race McManus’ racing manager Frank Berry stated “that was nice to get it out of the way and he jumped reasonably well and likes that good ground. He learned from Bellewstown and is getting the hang of the jumping. Beaten 9/10 favourite Penhill, which trailed in last, was later reported by his rider Ruby Walsh to have burst a blood vessel. 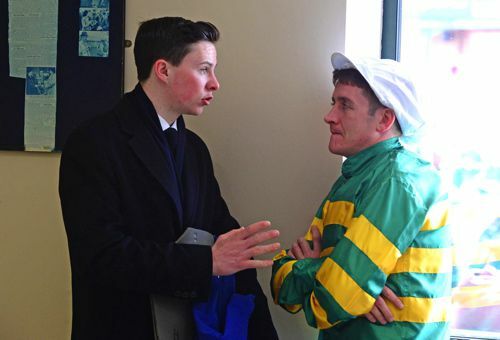 The Joseph O’Brien trained, J.P. McManus owned Oathkeeper, under Barry Geraghty, had little difficulty justifying long odds-on 2/9 favouritism in the Ladbrokes Ireland Maiden Hurdle at Killarney today, winning easily on his hurdle debut. 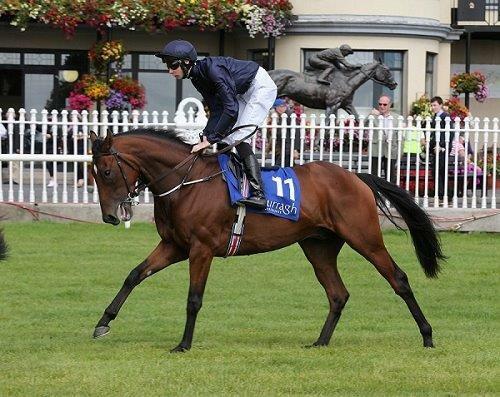 Following the success O’Brien stated “he is a lovely horse and always worked well at home. Former Ballydoyle Resident Hallmark winner of one of his 2 starts during his flat career has joined Joseph O'Brien's National Hunt Squad and is now owned by J.P.McManus and is set to debut at Kilarney in a maiden hurdle on Firday. The son of Montjeu has not been seen on the Racetrack since his last outing in a conditions Race at Kilbeggan last August where he finished 4th of 4 runners. Hallmark is a half brother to Il Palazzo & race winner Divine Night. He is a very nice addition for Joseph. Horses in training page updated > http://josephobrienfansite.com/horses-in-training.php . Exactoris got off the mark on his second start over flights, taking the Boomerang Animal Bedding Maiden Hurdle. Successful in two bumpers last year, the five-year-old son of Shantou finished eleventh of twenty-eight on his debut over flights at Navan in December. Stepped up to two and a half miles today, theJoseph O'Brien trained gelding raced behind the leaders, and was second with a circuit to race. He improved to dispute the lead four out where he made a mistake, and he led from the next. He was pressed and ridden before the second last, but he found plenty for pressure, going on to score by four and a half lengths. Air Command, who was backed from 7's to 9/2, finished second under Andrew Lynch forJim Culloty, while Jack The Wire (8's this morning and returned 2/1) was twelve lengths back in third for Denis Hogan. The winner opened on-course at 5/4 and touched evens, before drifting out to 11/8 and favourite at the off. Joseph O'Brien said afterwards: "He's a nice horse but jumped a bit green today. "He should improve plenty for this and I'll speak to JP (McManus) and Frank (Berry) and see where to go next. Galway could be an option and he is a nice staying type who will be better when he jumps a fence. "He was a bit fresh today as he had been off the track for a while." The Joseph O'Brien-trained Arya Tara completed a hat-trick as the O'Brien family dominated proceedings in the Roscommon Herald Handicap. 15/8 favourite Radar O'Reilly cut out the running in the race, which was over just under a mile-and-a-half, but was tackled two furlongs from home by Arya Tara. The 9/4 shot soon hit the front, under Ana O'Brien, and went on to score by two-lengths in the colours of her mother Anne-Marie. She was chased home by the Ana O'Brien-trained Immortal Bridge, which was ridden by Donnacha. The winner, a daughter of Dylan Thomas, was following up on victories at Tipperary in May and at the Curragh last month. Ana O'Brien said afterwards:- "She's very straight forward, and seems to handle any ground. She's done that well, and hopefully can win another one or two." 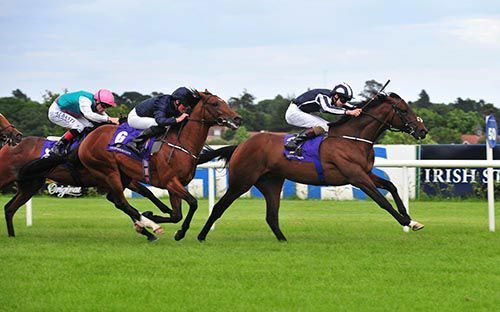 After a win for their sister Ana earlier, on the Eddie Lynam-trained Future Icon, Joseph and Donnacha O'Brien got on the score-sheet themselves in the finale at Naas, the Barbeque Evening July 20th Handicap with No Biggie. Joseph elected to bring No Biggie out again quickly, after his third placing at Fairyhouse on Wednesday, and it paid a rich dividend as the Lord Shanakill gelding ran away with the mile and a half contest, by four and a half lengths under Donnacha. The winning rider said: "He did it really well and the step up to a mile and half suited him. He relaxes very well in his races and he could go further." < No Biggie was bred by the O'Brien family's Whisperview Trading Ltd, and he went off the well-backed 5/2 favourite. Three time bumper winner Tesseract got off the mark on his third start over flights, taking the Tierney Kitchens Balbriggan Maiden Hurdle. The Joseph O'Brientrained five-year-old was fifth on his debut over hurdles at Leopardstown in December, before finishing second on his most recent start at Roscommon. Briefly available at odds against last night, the son of Trans Island soon went odds-on, eventually going off the 4/9 market leader in the colours of owner JP McManus. After racing in second under Barry Geraghty, he improved to lead five out, and kept up the gallop from the third last, going on to score comfortably by seven lengths. Lord Fendale (25's this morning and from 16's to 12's on-course) kept on to take second under Andrew Lynch for Steven Donohoe, while Timing'severything (5's to 4/1) was ten lengths back in third under Mark Walsh for John Kiely. "It's grand to get that out of the way. 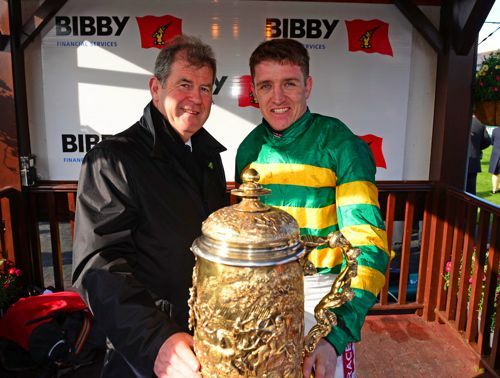 He jumped well and learned a bit from Roscommon where he was green," said Frank Berry, racing manager to JP McManus. "We'll try and find a winners of one for him now. The way he jumps, fences should be no problem for him and he might go chasing sooner rather than later." Geraghty added: "He did it well but I suppose it wasn't the strongest race. His jumping was a bit untidy, and that was the main concern. "You'd hope he learned from today, but he can jump well and then just miss one. I suppose he is a work in progress." Joseph O’Brien has had a busy first 19 days as a registered trainer and today claimed his first ‘Derby’ win, when his Arya Tara landed the DoneDeal Apprentice Derby at the Curragh today. The win was another family success for the O’Brien family, as Arya Tara was ridden to victory by the trainer’s sister Ana O’Brien and races in the colours of mother Annemarie O’Brien.< Arya Tara was also bred by the family’s Whisperview Trading Ltd and was the second winner of the day for Joseph O’Brien, who earlier supplied brother Donnacha O’Brien with a win on Reckless Gold. Trainer O’Brien, registering his 11th success in just 19 days as a licensed trainer, later stated “she won her maiden well the last day, and we thought she had a nice handicap mark. "We were hoping to get black type eventually, and that is probably where she will go now. "It's a great result for all the family, and Ana gave her a good ride - I never won this race (as a jockey)!" The Joseph O’Brien trained Reckless Gold overcame an eight month layoff to win on his first start as a three year old in the DoneDeal European Breeders Fund Maiden at the Curragh today. Ridden by the trainer’s brother Donnacha O’Brien, the son of Pivotal, having his first run since October, went clear with a furlong to race before recording a four and a quarter lengths win over Saafarr. Afterwards trainer O’Brien stated “he always had an engine and he'd a couple of nice runs last year. He had a little setback through the winter and that's why he's only coming out now. "He handles ease in the ground, and a stiff mile is perfect for him. I'm happy to get today out of the way, and we'll probably look for a Listed or Group race with him now." A strong edition of the Tattersalls Ireland Derby Sale posted a much-improved set of returns following another good day's trade on Thursday, with proceedings headed by a Presenting gelding which was knocked down to Joseph O'Brien for €185,000. At its conclusion the sale produced turnover of just under €14.3m, which was an improvement of 14 per cent on last year's figure. 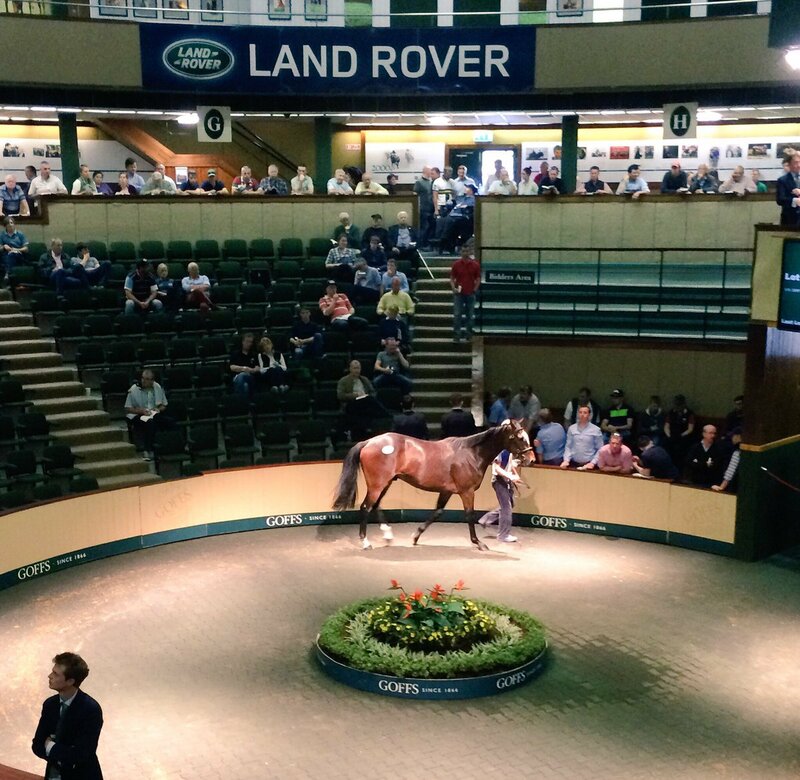 The €47,535 average was a new record for the sale while the €36,000 median equalled the previous high in this category. Centre stage on Thursday went to the Rathbarry Stud-consigned Presenting three-year-old who was among several high-profile purchases made by O'Brien. The clearance rate did drop by three points to 82 percent while the 32 six-figure transactions represented a new record for the sale. Margaret O'Toole was among those to challenge for the relation toRocky Creek and Tell Massini, but she eventually had to give best to O'Brien. "He's a very nice, athletic type of horse from a good jumping family. He's a good horse and he was entitled to make a good price," declared O'Brien. The rookie trainer also signed for a €120,000 son of Gold Well and he matched that price for a Milan brother to the Leinster National heroine Miss Xian from Kitty Cowhey's Loughmore Stables. End of Day 2 of Tattersalls Ireland Derby sale & Joseph O'Brien has taken his Purchases up to 11 lots at a cost of 935,000 Euro. 1st buy a yearling, from the family of Norse Dancer at E70,000. 3rd buy a son of Presenting From the family of Rocky Creek and Tell Massini at E185,000.. The Joseph O’Brien trained once-raced Eagle Spirit defeated a pair of his father Aidan O’Brien-trained newcomers to win the Irish Stallion Farms European Breeders Fund Maiden at Leopardstown today. Ridden by the winning trainer’s brother Donnacha O’Brien, Eagle Spirit stayed on well when pressurised in the home straight for a half length win over Venezuala, with a further half-length back to Diodorus, both of whom represent Aidan O’Brien’s Ballydoyle team. Following the win, Owning based Joseph O’Brien stated “he had a nice run here first time. “Donnacha said it wasn't ideal making the running as he was quite green in front and he'll be better taking his time. 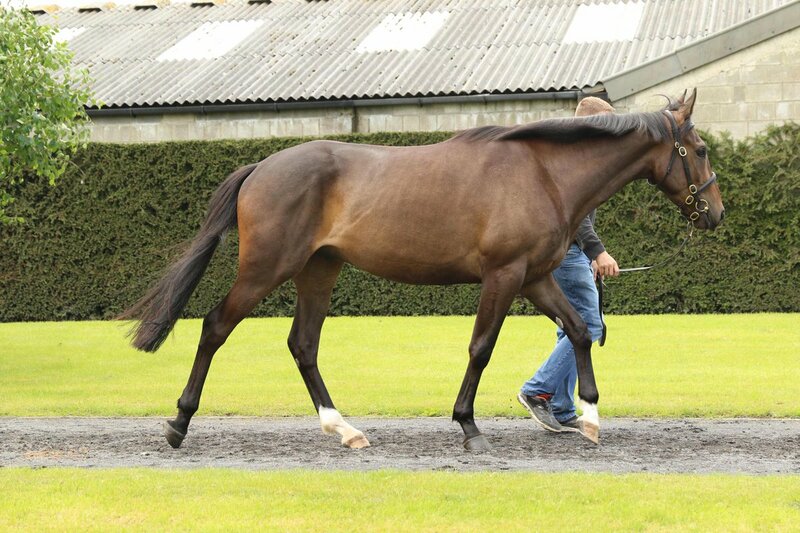 Let's Twist Again, 4yr bay gelding by Galileo owned by J P McManus. Unraced on flat - Full Brother to Gypsy King a winner for Ballydoyle. 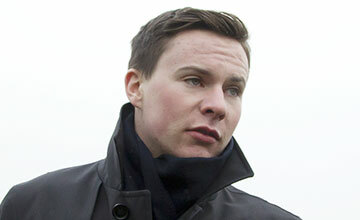 Joseph O'brien Horses in Training Update > http://josephobrienfansite.com/horses-in-training.php . Joseph O'Brien has purchased 7 lots totaling 445,000 Euro. His Top buy was Lot 179, a Bay Gelding Named Paris Texas - Kapgarde x Paric De La Borie for 115,000 Euro & another top purchase was a gelding by Flemensfirth a relation of Grade 2 winner OSCAR TIME who went for 100,000 Euro. M V Magnier also purchased 4 lots on behalf of Coolmore. 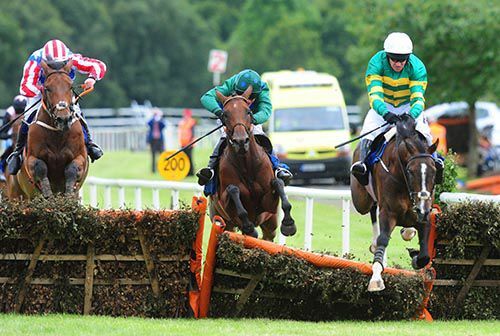 Motherland was very solid during the day for Ballinrobe's mile and five maiden and his supporters had very little to worry about as he hacked up in good style. Joseph O'Brien's Galileo colt was backed from 6/4 to 10/11 before racing but bookmakers at the track evidently set out to get him in their satchels as he opened at even money and drifted out to 5/4 on the off. He stayed on for third in a mile and a quarter maiden at Roscommon earlier this month and was stepped up in trip for this evening's assignment. Donnacha O'Brien, on board the favourite, tracked Lazio before asking his mount for his effort over two furlongs out. The response was immediate asMotherland soon swept by Lazio and quickened away approaching the home turn. 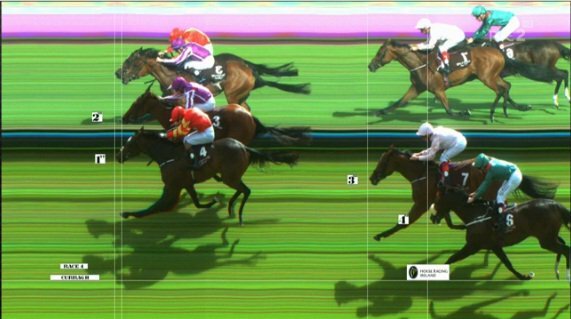 He drew further clear to hit the line seven lengths to the good. Sea Of Mystery (7/4) came through to take second by a couple of lengths from Lazio(33/1). Donnacha O'Brien said: "He's a lovely horse - he's out of a good sprinter but he relaxes so well and has a good attitude and it means he has a turn of foot over that distance. "He could make a nice stayer and is taking his racing well." Joseph O'Brien's Intricately make a taking debut when sluicing home in the seven furlong juvenile maiden at Gowran Park. The going had eased to yielding to soft as the 10 runners were loaded for this opener.<Intricately raced in second as 4/6 favourite Sir Edwin Landseer broke well to lead. As the runners entered the home straight, Randall Stevens improved to second with Intricatelyin third. The race looked to be between the odds-on favourite and Randall Stevens, who was battling away on his outer, but Michael Hussey asked for more from Intricatelyapproaching the final furlong. He got a terrific response from the Fastnet Rock filly who picked up really well inside the furlong pole and readily overcame Sir Edwin Landseer with 100 yards to race. She won going away by a length and a quarter at 33/1.< Sir Edwin Landseer had to be content with second under Donnacha O'Brien. 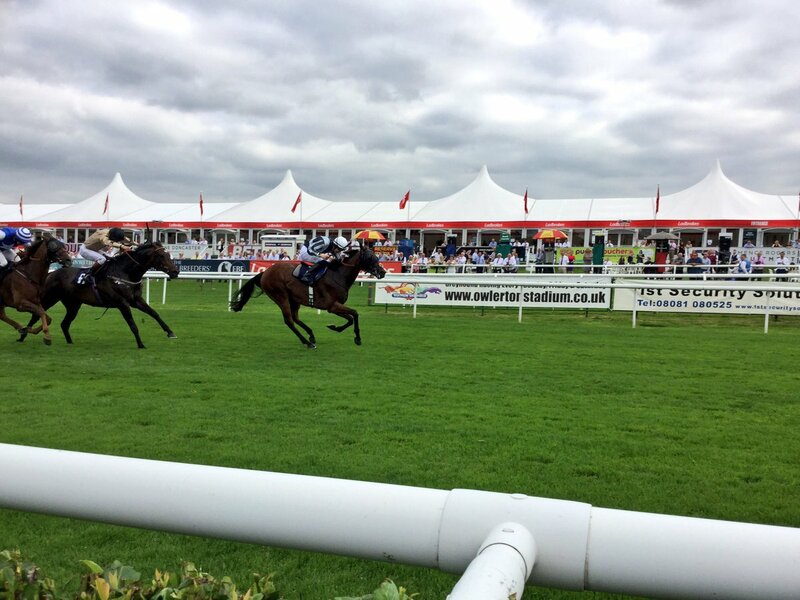 He came home three parts of a length ahead of third-placed Randall Stevens (4/1). David Simmonson partnered Randall Stevens as Kieren Fallon gave up his rides today due to a bad chest infection. The gambled-on Pindaric (12/1 to 7/1) was never better than fourth and could make no impression in the final furlong in finishing fifth. Joseph O'Brien said: "She was working fairly well but I thought she'd be very green around here first time. “She wasn't as green as I thought and Michael gave her a great ride. The race worked out well for her and she seemed okay on the ground. The going was changed to soft after the first race with the rain still falling. G Hourigan purchases LUNDY by Fastnet Rock x Princess Janie 2014 Colt for £400,000. Purchased for Scandanavian owners he will stay with Joseph for now. Fleming Velin the Danish owner that bought Fields Of Athenry last season bought Lundy. 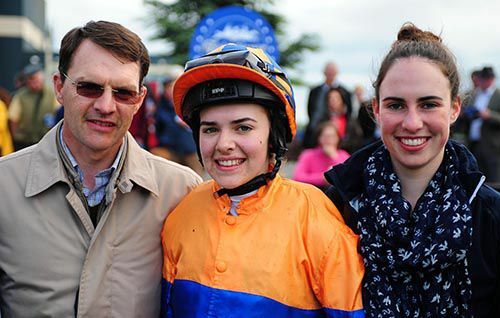 Joseph O’Brien’s dream start to his training career since issued with a licence just last weekend continued as the dual-purpose handler sent out his sixth winner in the space of five days when Oh Me Oh My made a successful debut in the BBQ Evening At Clonmel Races Maiden Hurdle. Jody McGarvey oozed confidence as the Winged Love mare struck the front approaching two out, where nearest rival Abbazagga blundered badly. The easy-to-back 4/1 winner was far from fluent herself at the final flight but had plenty in reserve to beat the staying on Patricks Park by two and a half lengths. Abbazagga, who cut out most of the running, was a further six and a half lengths adrift in third, while the odds-on Killarney Lakes was in trouble after a bad mistake three out and could only manage sixth. O'Brien said, "She is a nice mare. Initially the plan was to start off in a bumper but this race looked suitable for her. Jody said she jumped a little bit novicey in places but you'd imagine she'll stay further and it's good to get a winner. "Her owner James (Coleman) is local as well. Her dam won over fences, so she'll jump a fence in time. "I've had a great start. On Monday the races just suited the horses and it just happened like that, you couldn't have organised for something like that to happen. It was just a great start and we'll try and keep it going now." 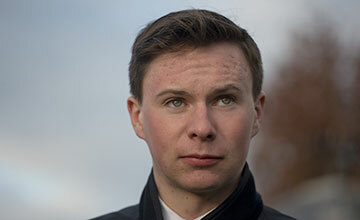 Joseph O’Brien has made an excellent start to his training career and having receiving his trainers’ license last weekend, followed up Monday’s four-timer with his fifth career winner at Leopardstown today when No Biggie landed the concluding Copper Face Jacks Handicap, under his sister Ana O’Brien.< No Biggie was one of three beaten O’Brien-trained runners(from his seven) on Monday but improved on his fourth place finish then when making most to eventually beat Tasty Ginger. Lot 197 3yo b/g Stowaway For E25,000. Lot 220 3yo b/g Shirocco for E78,000. Lot 253 3yo b/g Stowaway for E38,000. Lot 330 3yo Oscar E47,000. FRESH from sending out a memorable across the card four timer at Listowel and Gowran yesterday, Joseph O'Brien has made a notable impact in the ring at the Goffs Land Rover Sale today. The young trainer outlasted David Minton and Nicky Henderson for a popular son of Yeats who eventually came his way at €100,000. The €25,000 foal purchase is a half-brother to the dual Grade 2-winning hurdler Desert Cry and the useful jumper Dysios. Fantastic start for JOBFS as we hit over 400 Unique Visitors in a day yesterday and are near 2000 in total. Oathkeeper rounded off a memorable Bank Holiday Monday for his trainer Joseph O'Brien, who recorded four winners on his debut day as a trainer. 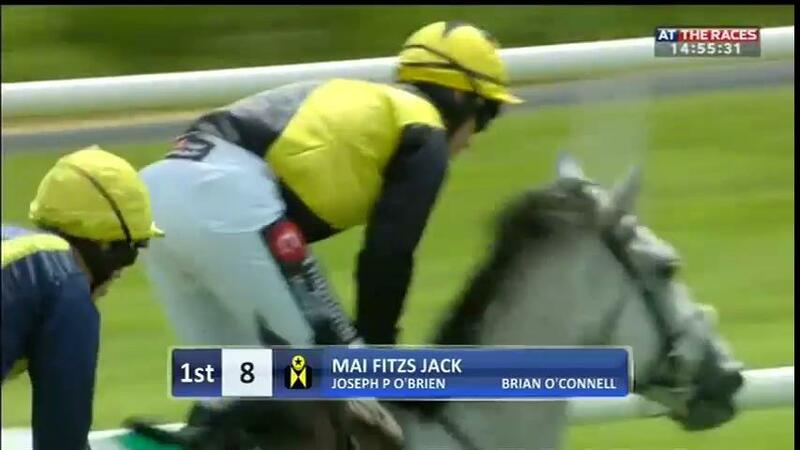 Successful with his first runner Justice Frederick at Gowran, O'Brien then registered his initial victory under National Hunt rules with Mai Fitzs Jack at Listowel. Zig Zag made it three by taking a handicap at Gowran (providing brother Donnacha with a double), whileOathkeeper completed the four-timer in the concluding bumper at Listowel, the Dr Louis O'Carroll Flat Race. A winner on his debut at Roscommon last June,Oathkeeper was then beaten into second on his next start at Tipperary in October. Sent off the 11/8 favourite today, he raced just behind the leaders in the early stages, tracking his main market rival Bel Sas. He went second with a circuit to race, and cruised alongside Bel Sas over two furlongs from home. He was pushed to the front a furlong and a half out, and he kept on strongly from there to score by nine lengths under O'Brien's sister Sarah.< Bel Sasfinished second under Patrick Mullins for his father Willie, while Smitty Bacall (18's to 12's on-course) was a further length and a quarter back in third under David Kiely for Shay Barry. Joseph O'Brien wasn't present at either Gowran or Listowel today. He instead went to the sales at Goffs. 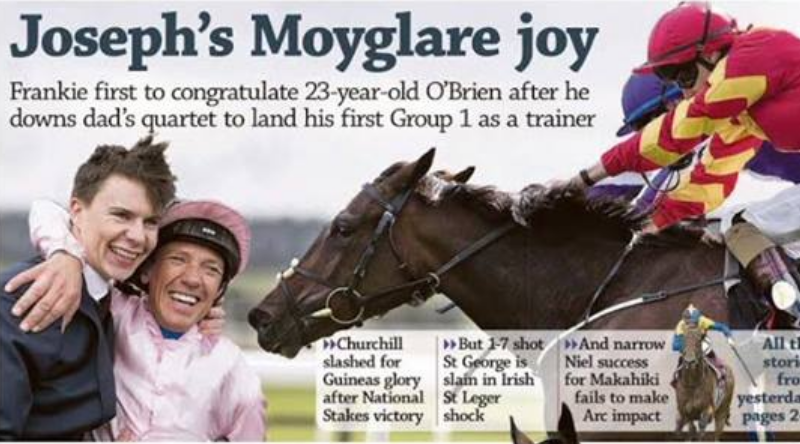 His father Aidan O'Brien said afterwards: "It's very exciting and great also for JP (winning owner JP McManus). "It (Joseph's career) is something to look forward to and he looks a fair horse. "I think he might be going jumping now but Joseph will discuss that with Frank (Berry. McManus' racing manager). "It has been an incredible day and how can you improve on that!" 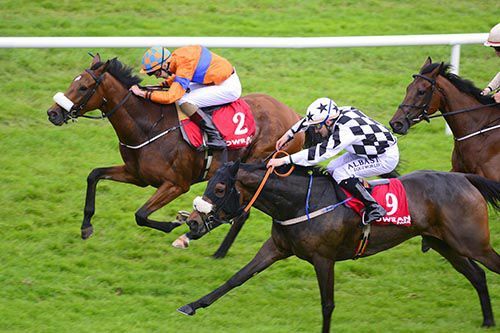 Zig Zag (7/1) made it three on the day for Joseph O'Brien, and a double for his brother Donnacha, as he got up close home to land the Gowran Park Golf Club Handicap. Joseph O'Brien got his training career off to the perfect start when Justice Frederick took the opener at Gowran under Donnacha. He then completed an across the card double when Mai Fitzs Jack provided him with his first winner under National Hunt rules at Listowel. Zig Zag, who had never won before today, was sent off a 7/1 chance here on his thirteen career start. In rear early on, the son of Zoffany made some progress into mid-division with three furlongs to race. He was ridden from the two furlong pole and got a nice run through on the rail from over a furlong out, keeping on well from there to lead close home, going on to score by a neck. Phebes Dream (5/1) kept on well to take second under Shane Foley for John McConnell, while Prairie Wind (12/1) was a further length and a quarter back in third under Leigh Roche for Andy Oliver. Three Majors was sent off the 9/2 favourite and he finished a very disappointing thirteenth under Chris Hayes for Paul Deegan. Winning owner Anne-Marie O'Brien, who is the mother of the successful jockey and trainer, said afterwards: "It's been a great day for Joseph, and it's nice to get a bracket for this horse. He'll go for something similar again. "I thought Ana's horse (No Biggie who finished 4th) was coming there to win, and I didn't really notice Donnacha until late on. He got a nice run up the rail, and finished well." Less than an hour after recording his first winner with Justice Frederick at Gowran,Joseph O'Brien completed an across the card double, as his Mai Fitzs Jack made all to win the John B. Keane Maiden Hurdle. 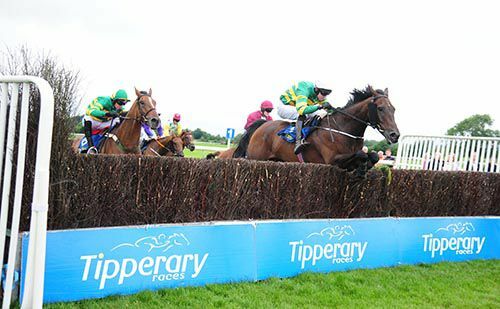 An unlucky second on his hurdling debut at Tipperary last month, the seven-year-old son of Acambaro was sent off the 4/9 favourite this afternoon. Sent straight to the front by Brian O'Connell, who was completing a quick opening race double, he stretched clear on the approach to the straight, and eased to a ten length success. Pat Kelly trained the second and third, Licklighter (50/1) and Kansas Kid (50/1), and there was eight and a half lengths between them. 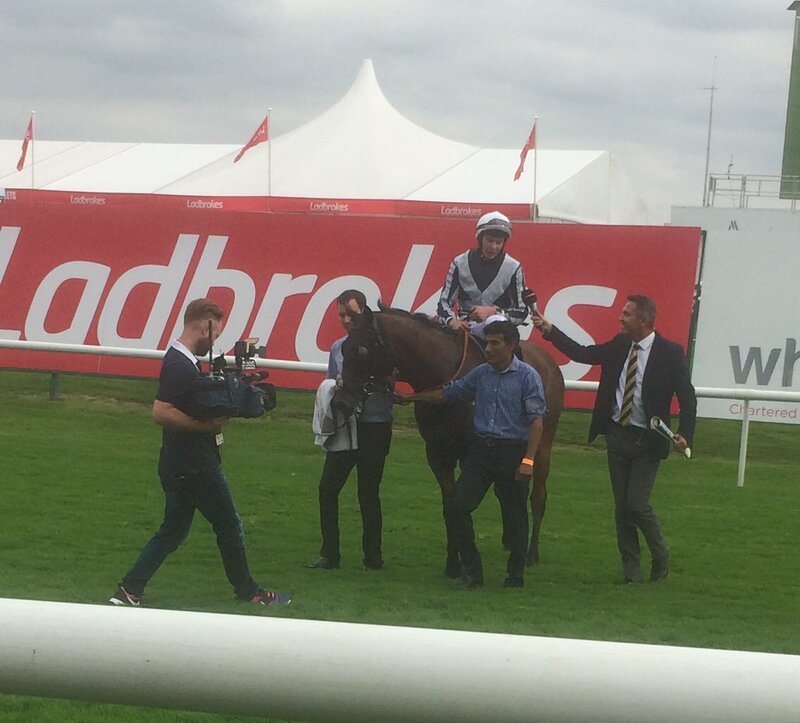 Aidan O'Brien, father of the winning handler, said afterwards: "Straightaway I got put in my place! 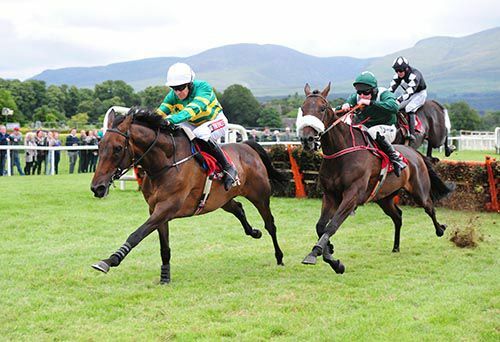 "It was great in Gowran and our own horse (runner-up Leo Minor) maybe got a little tired and I underestimated the strength of Joseph's horse obviously. "His (Joseph's winner Justice Frederick) first run was over five and he is a horse that will get seven and further. "This horse (Mai Fitzs Jack) was unlucky the last day when he made a mistake at the last two and I think the winner was a decent horse. "I'm not sure but I'd imagine he'll (Joseph) keep him busy over the summer. "It's a massive day for us and it's great to get a win both jump and flat. "I couldn't believe when someone said to me that it was 23 years ago to the meeting (then at Tralee) that I had my first winner with Wandering Thoughts - I couldn't believe that, it is some coincidence. "Joseph loves it (training) - he loved riding but it was tough for him for a long time (with weight) - doing nine stone every morning was very hard. "He's a big man now, he's well over 11 stone and he doesn't look heavy. "No one will get more pleasure than me but I'll have to keep my eye on the ball now! "<Mai Fitzs Jack won two point-to-point's for Mary Louise Hallahan and he went unsold at 26,000 pounds at Brightwells in December of 2014. JOSEPH O'BRIEN'S transition to the training ranks got off to a flying start on Monday with his first runner with a licence, Justice Frederick, winning the opener at Gowran Park. The two-year-old, owned by Maxwell Morris, justified favouritism to score on his second start under the trainer's younger brother, Donnacha, defeating Leo Minor - trained by their dad Aidan - by a length-and-a-half. Justice Frederick, who ran under Aidan O'Brien's name when third eleven days ago, is entered in the Group 1 Keeneland Phoenix Stakes at the Curragh on August 7. The former dual champion jockey in Ireland saddles six more runners this afternoon - three apiece at Listowel and Gowran Park. 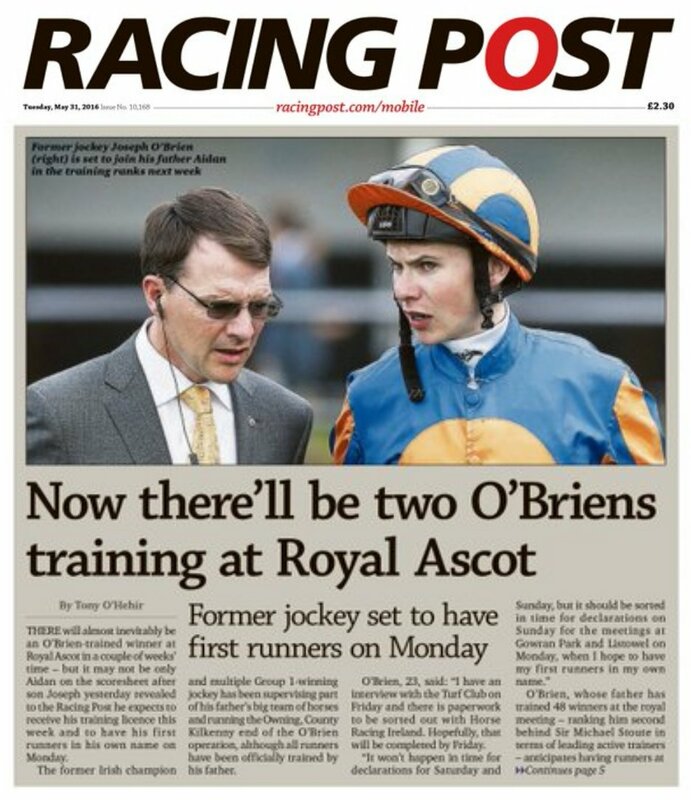 Joseph Patrick O'Brien for the first time will have horses run in his own name today. 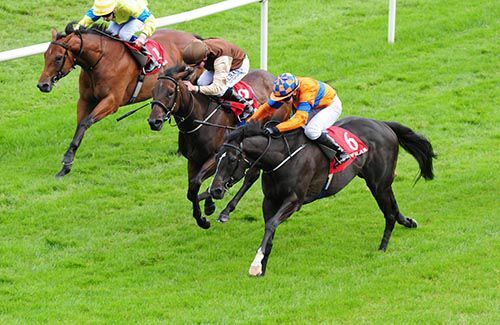 He will be represented by Justice Frederick (2.05) Song Of Love (4.05) Zig Zag & No Biggie (4.35) At Gowran Park & Kalopsia (2.20) Mai Fitzs Jack (2.50) Oathkeeper (5.20) at Listowel lets hope he can get off the mark early best of luck Joseph. 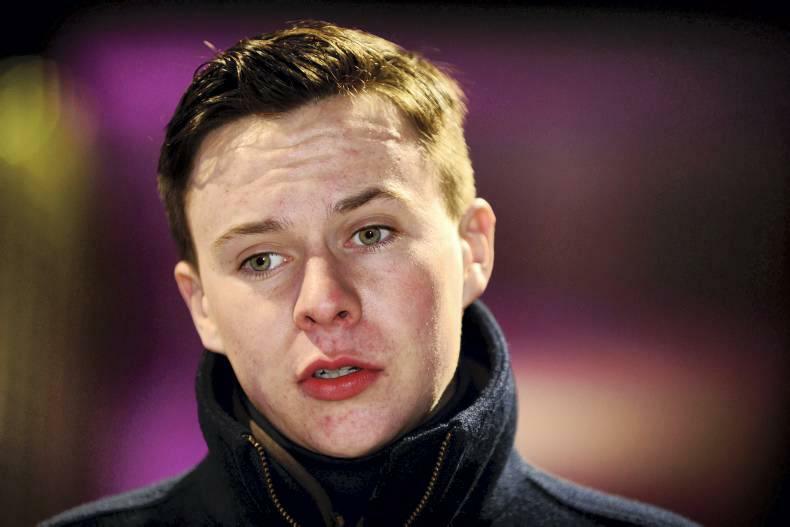 Joseph O’Brien’s wait to achieve ‘trainer’ status will finally (and thankfully!) end on Monday as the dual Champion Jockey is set to send out his first official runners at both Listowel and Gowran. Always up there in the pace-setting role, King Leon (Mark Walsh) led home a one two for Aidan and Joseph O'Brien in the McHale Mayo National Handicap Chase as owner of the first two, J P McManus, completed a big race double at Ballinrobe. Course winning King Leon (10s into 17/2) led home by the Barry Geraghty-riddenCarriganog (5/1 joint favourite) at a distance of a length and a half. McManus had earlier seen his colours carried to victory Barry Geraghty on the Charles Byrnes-trained Shanpallas in the McHale Coranna Handicap Hurdle. McManus' racing manager Frank Berry said afterwards: "It was nice to relax as they were coming down to the last anyway! "The winner jumped great and Mark gave him a great ride. It is a lovely race to win and all credit to Ballinrobe for putting on two lovely pots today. "The track is in great order. We will try and find a similar race for both of them now." K.C. Sexton, rider of Rohan's Pride trained by Peter Fahey, reported to the Clerk of Scales that his mount was pulled up having jumped poorly and lost his action. Leopardstown winner Lundy (pictured above), a son of Fastnet Rock who went on to be a close second in the Listed Rochestown Stakes will be for sale at the Goffs London Sale on the eve of Royal Ascot. As before, most Lots will be offered in absentia having undergone a full veterinary examination, with x-rays as well as being filmed for purchasers to view them on line. Alternatively all horses-in-training can be seen at their trainer’s yard by appointment. The first section of the Sale is for Breeze-Up horses and the 21 entrants will breeze at 11am on Sunday 12 June at Kempton Park Racecourse and will be available to view at Kempton. THERE will almost inevitably be an O'Brien-trained winner at Royal Ascot in a couple of weeks' time - but it may not be only Aidan on the scoresheet after son Joseph revealed to the Racing Post he expects to receive his training licence this week and to have his first runners in his own name next Monday. The former Irish champion and multiple Group 1-winning jockey has been supervising part of his father's big team of horses and looking after the Owning, County Kilkenny end of the O'Brien operation, although all runners have been officially trained by his father. O'Brien, 23, said: "I have an interview with the Turf Club on Friday and there is paperwork to be sorted out with Horse Racing Ireland. Hopefully, that will be completed by Friday. "It won't happen in time for declarations for Saturday and Sunday, but it should be sorted in time for declarations on Sunday for the meetings at Gowran Park and Listowel on Monday, when I hope to have my first runners in my own name." Joseph Has two entries in The Mayo National at 8.30 tomorrow at Ballinrobe Races. Carriganog & King Leon. 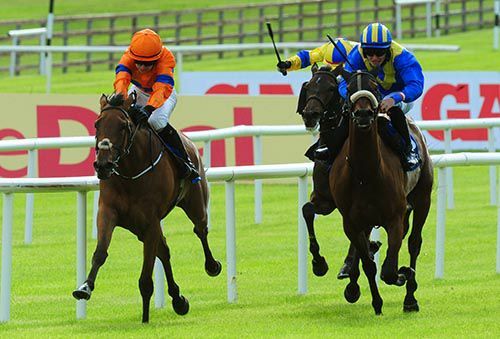 We got an exciting conclusion to the Listed Coolmore War Command Rochestown (C & G) Stakes. Ballydoyle's Peace Envoy got the better of the Owning Hill-based Lundy as Aidan O'Brien goes down as the handler as the first two home.